The Portland Food Co-op is operated by a team of around 40 paid employees from a variety of backgrounds, working together to offer our Member-Owners and shoppers the best local, organic, and natural products in town. We are committed to providing a welcoming, friendly, and supportive environment to all who visit our store. If you have any questions, please feel free to ask. Co-ops can be intimidating for those who have never been to one before, and we understand that. We do things like let folks bring in containers from home, to fill in our bulk department. We sell lots of dairy products in glass jars that can be returned. We have a rewards program for people who shop with SNAP benefits. We know that you will have questions and we are here to answer them. We receive many compliments about having the most friendly and helpful staff around. Come on in and find out for yourself. Alex has been with the Co-op since May of 2017. She has a background in Outdoor Leadership and moved to Portland from Asheville, North Carolina with a hunger to continue learning and to try something new. Her expertise in eating good food and enthusiasm for supporting local businesses steered her through the doors of the Co-op. Alex was immediately struck by the warmth of the employees and thought, “This seems like such a great place to work!” She still feels this way and loves the connections she has made with co-workers and customers alike. She is committed to making the Co-op welcoming and accessible to the neighboring community as she strengthens those personal connections. When Alex is not working, she enjoys what any fun lovin’ gal might enjoy: riding her motorcycle Purple Rain with her partner Maeve on the back, and their two cats Eyeballs and Faded Glory in the side car. Everyone wears helmets. A former freelance designer and illustrator, Chris is passionate about supporting the community and the local food system. His favorite part about the Co-op is the great work environment where he enjoys his colleagues, who share similar values, Outside of the Co-op, Chris enjoys the local music, film, art, and ice hockey scenes, reading on the Eastern Promenade, and munching on Two Fat Cat cinnamon rolls, . Cricket's journey into the world of working with local farmers began at Green Grocer. Since then, she has worked in a range of capacities at a number of natural food stores including the Whole Grocer, Wild Oats, Bath Natural Market, and Whole Foods Market. Portland Food Co-op is her favorite so far due to the wholesome, friendly, health conscious, and downright special people who come to the store including her fellow staff. When she is not at the Co-op, she enjoys hiking, cross-country skiing, snowshoeing, thinking about, looking at and sometimes making art, cooking, baking, spending time with friends, and drinking delicious beer. More than anything else, she cherishes her family including her teenagers (Gage and Finabelle), her fiancé, Matthew, and their puppy, Sophie. Emily comes to us from Keene, NH where she served as the Produce Manager of her local co-op for years. She is passionate about supporting local growers, and procuring the best quality products in our region. With a background in culinary arts and working as a chef in many restaurants throughout her hometown, she is very knowledgeable about the wide variety of products we carry and how to best prepare them. Feel free to seek her out for recipe ideas and inspiration! Although she is new to Portland she has already fallen in love with the vibrant food, music, and art scene and glistening coast line. Jan Peyton Rowley is a native Minnesotan with an academic background in pipe organ and symphonic and sacred choral music performance, Women Studies and Nutrition. She spent 25 years working in high-technology recruiting and staffing in Silicon Valley, California, and now resides in Portland, ME where she is the bookkeeper for the Portland Food Coop, formerly the bookkeeper for First Radio Parish Church of America, and is currently both Administrator and Organist at St. Ansgar Lutheran Church. John grew up in grocery stores. His grandparents owned a general store in the Downeast Maine town of Whiting. His parents owned “Crane’s Market” in Ellsworth, Maine. He’s been stocking shelves and running cash registers from a very young age. John began his career journey as a social worker and then as a massage therapist. There was also a brief trip into the world of IT administration. When he joined La Montanita Co-op in Albuquerque, back in the 90’s, he knew that someday he wanted to work in co-ops. He spent nearly a decade at the Rising Tide Co-op in Damariscotta before moving to Portland in 2011. He served on several committees during our Co-op’s start-up phase (Business Planning, Store Design, Project Manager Advisory), was a Board member, and then became General Manager shortly after the store opened. Beyond his work here at the Co-op, John serves on the Board of the Neighboring Food Co-op Association, a federation of co-ops from across New England and New York that are working together toward a shared vision of a thriving co-operative economy, He is on the steering committee of the Cooperative Maine Business Alliance, which develops networking and collaboration opportunities for co-ops all across the state. He also serves on the board of Portland’s India Street Neighborhood Association. He firmly believes that community-owned food cooperatives are the most viable and sustainable option to retain control over our local food system and our local economy. Justin has been working at the Co-op since 2016. He comes from a varied background of restaurants, farming, carpentry, and working at other co-ops. With a strong interest in sustainable food systems, he enjoys working with the community and producers to contribute to a holistic local food economy. As the Specialty Buyer, he finds that there's never a dull moment in Portland's vibrant culture of craft beer, fine wines, and tasty cheeses. When he’s not at work, Justin can be found sunbathing with his plants and composing new age music. Justine is the buyer of all things bread related. She can also be found in the produce department, on the front end or drawing signs throughout the store. Prior to the Co-op she spent 5 years working at her hometown health food store & apothecary. She’s also sold vintage clothing, worked on farms, and studied herbal medicine at Sage Mountain. Justine's favorite part about working at the Co-op is its capacity to promote inclusivity and positive change within our community and our food system. She is very passionate about her houseplants, visual art/poetry, and making medicine. When she’s not at work, she’s probably at the thrift store or at home with a cup of tea, surrounded by tinctures and playing with synthesizers. Prior to coming to the Co-op, Kevin was the Director of Operations for one of America's most Iconic department stores, a Presentation Team Member for a large big box store, and flipped donuts at a historic bakery in Cape Elizabeth. He loves working for the Portland Food Co-op because he gets to bring local producers and shoppers together and finally feel that what he does makes a difference to people everyday. He is passionate about three things: his family, music, and helping perpetuate a sustainable local economy. When he is not working, he loves to spend time with his wife, April, and their four kids, Zevin, William and twins, Asher and Mya. You can also find him in his home studio writing music or helping someone else get their thoughts or ideas from their head through a mic and onto something tangible they can share. He also DJ's for parties, special events and weddings under the name Eff Major Productions. Matt has been at the Portland Food Co-op since September of 2014, participating in the hiring of the original staff and the Grand Opening. Matt has a varied work history, from working as a truck driver in Arizona to a strong history in retail management and the grocery world. Matt is extremely happy to be putting all his experience to use at PFC, where he feels he was finally able to find a career that aligns with his personal values. Matt is a lover of nature, arts and woodworking, and, when not at the co-op, he can often be found enjoying the woods and waters of Maine with his family and dog. Megan Banner has been with the Co-op since the opening of our retail space in 2014. Before her time here, she worked in a variety of capacities in the non-profit museum industry and studied Folklore and Ethnomusicology in Newfoundland. After moving to Maine, she was immediately struck by the local farm community and feels fortunate to be able to support and help strengthen our local food system. When not in the store, Megan Banner is most likely outside enjoying the bounties Maine has to offer. Patrick has been cooking at the Co-op for going on two years. He loves this working atmosphere where he is surrounded by friendly and helpful folks everyday. This is Patrick’s first job in the States. He comes to us from South Africa where he also worked as a cook. Outside of work, he spends most of his time with his fiance, Grace and going to school. Rebecca moved to Maine from the other Portland (Oregon) in July 2017 and joined the Co-op store team that August. She feels incredibly lucky to have landed in a work environment that is so well connected to the community and is blown away by Maine’s commitment to creating a strong local food economy. With a background in marketing with Whole Foods Market, Rebecca is passionate about bringing folks together around healthy, happy food systems. Outside of work, Rebecca enjoys throwing dinner parties, doing yoga, and singing/dancing her heart out. Spero has enjoyed a long and diverse work life. In 2002 he completed a 20 year restoration of his family’s historic hotel and movie theatre in Brattleboro, VT. For 8 years he was the chef in his very popular restaurant/brewery, the Latchis Grille. In the mid 90s, Spero began his study of homeopathic medicine and for the last ten years has lived in rural India running a busy homeopathic health clinic, as well as a no-till organic permaculture farm. 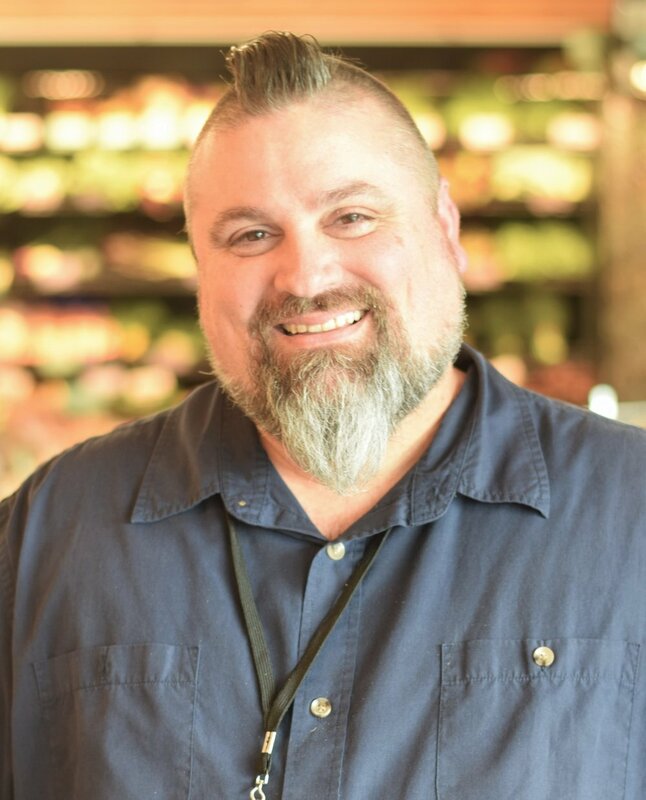 As the Co-op deli manager Spero is committed to supporting local organic agriculture by creating delicious healthy foods that nourish the earth as well as the people who enjoy them.